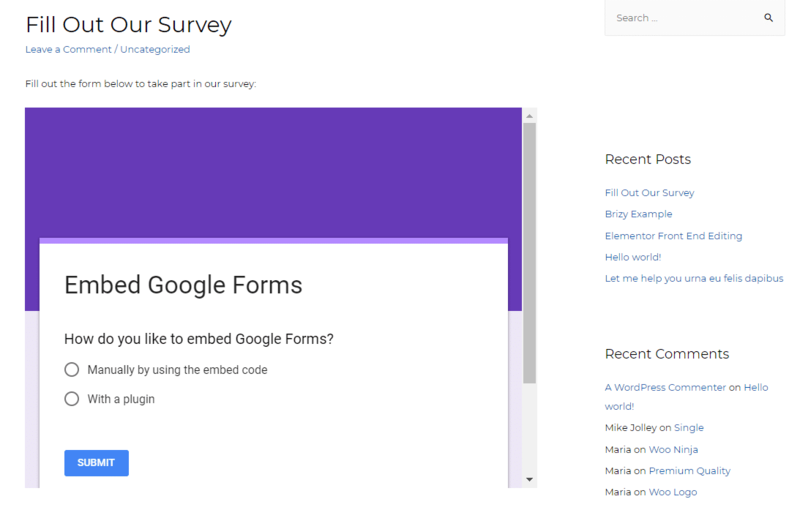 Looking for a way to embed Google Forms in WordPress? Google Forms is great because of how easy it makes it to create complex forms, as well as the detailed analysis options you get for viewing responses. 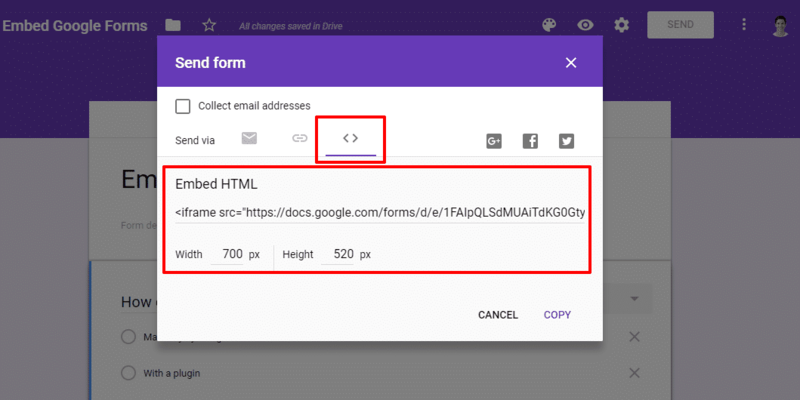 But it’s not very user-friendly to link your visitors to an external site just to fill out a form, so it makes sense that you’re looking for a way to bring those Google Forms onto your WordPress site. For basic uses, the manual method is fine. But the plugin method offers a unique twist in that it lets you embed Google Forms as an actual HTML form on your site, which gives you more options for customizing how your form looks and functions. If you’re a beginner, I recommend you stick with the manual method (that’s the first one I’ll show you). But if you want more control than the manual method offers, the plugin is a good option, it just has some quirks. If you haven’t already, get started by creating a Google Form just like you normally would (you can do that by going here). 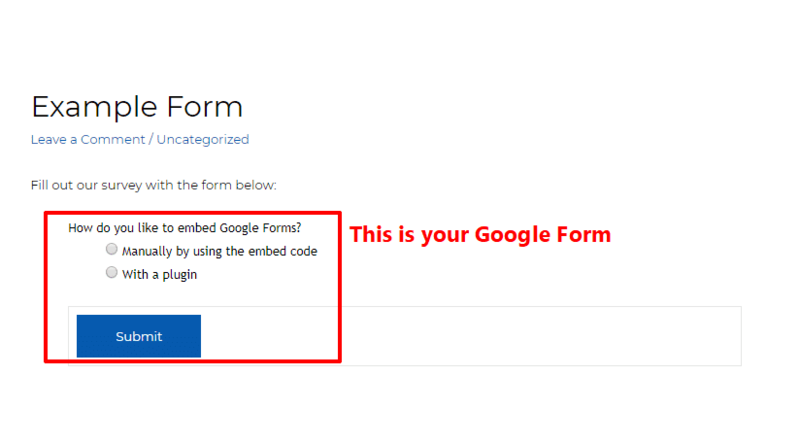 To finish things out, go to the post or page where you want to embed your Google Form. The styles on your embedded form will automatically update. Why Does My Embedded Form Look Weird On Mobile Devices? It still won’t look perfect, but that can help make the sizing better, at least. 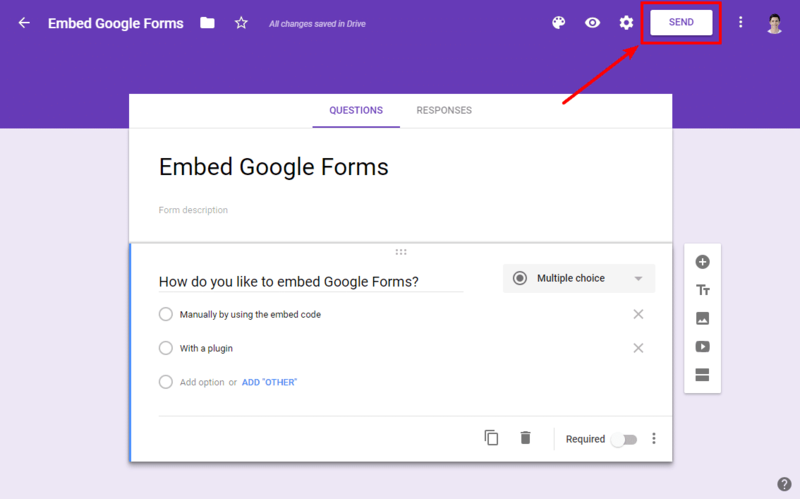 As an alternative to the manual method, there’s also a popular free plugin named…Google Forms. 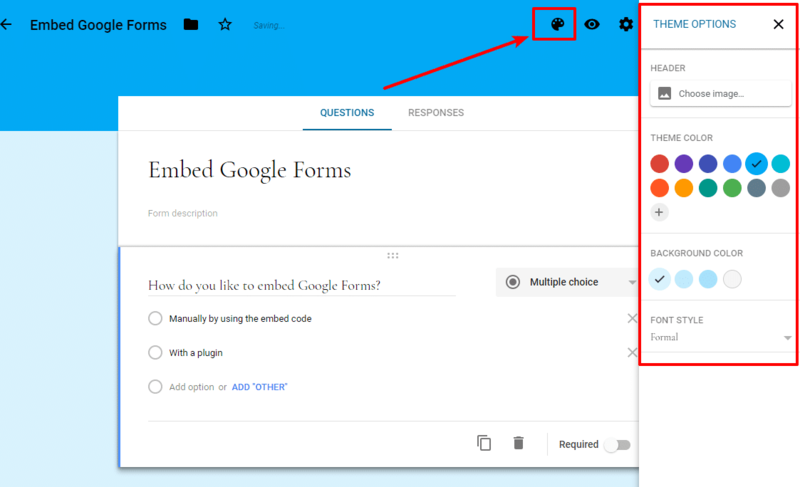 Renders the Google Form as an HTML form on your site. In general, it gives you a lot of control over your forms. But the downside is that you have to use the old version of Google Forms if you want to use the plugin. 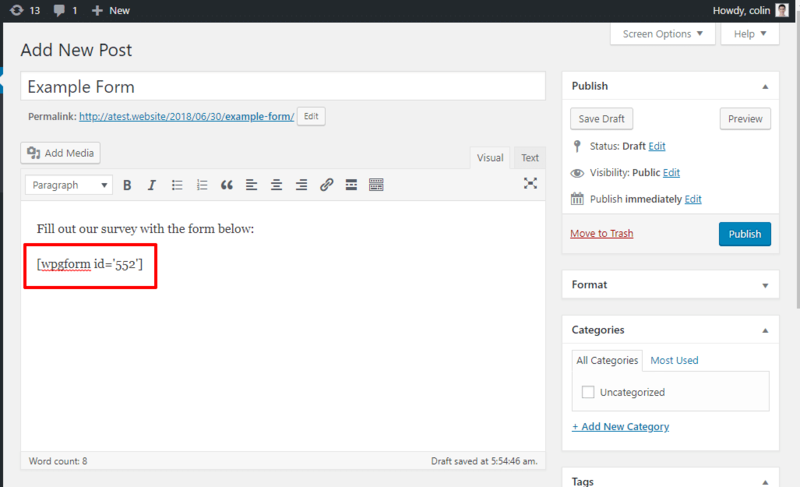 Now, you can customize your form using the plugin’s many options. 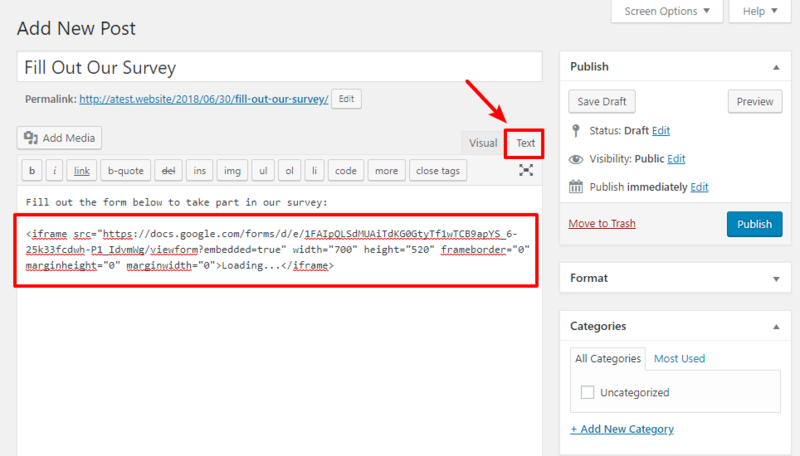 This is the biggest advantage of using the plugin over the manual embed. Once you’re finished, make sure to Publish your form. 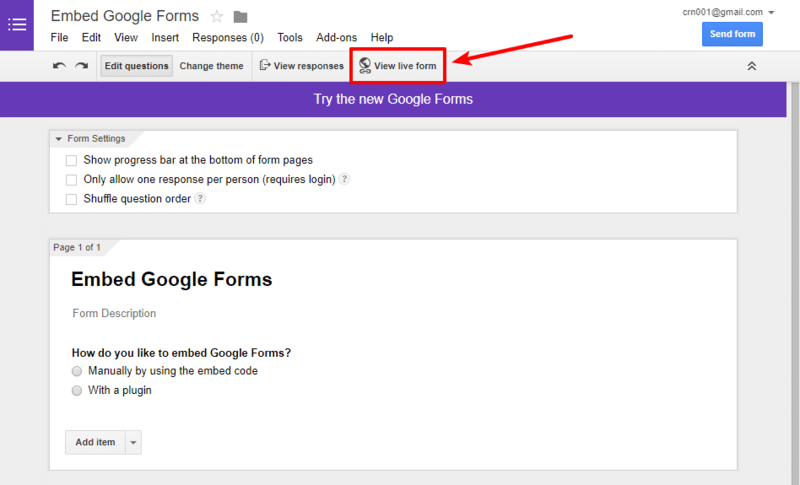 Even though it uses your own HTML styles – form responses will still show up in the Google Forms interface. Unfortunately, your form will stop working if you ever go back to the new version of Google Forms. 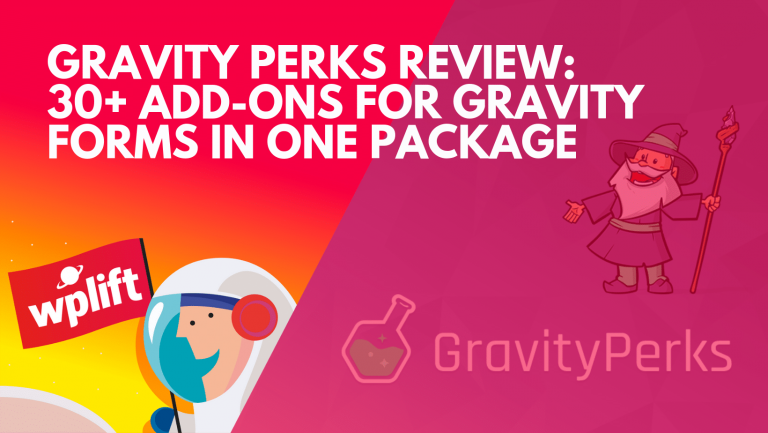 But as long as you keep using the old version, you can continue to use the plugin and take advantage of its many customization options. 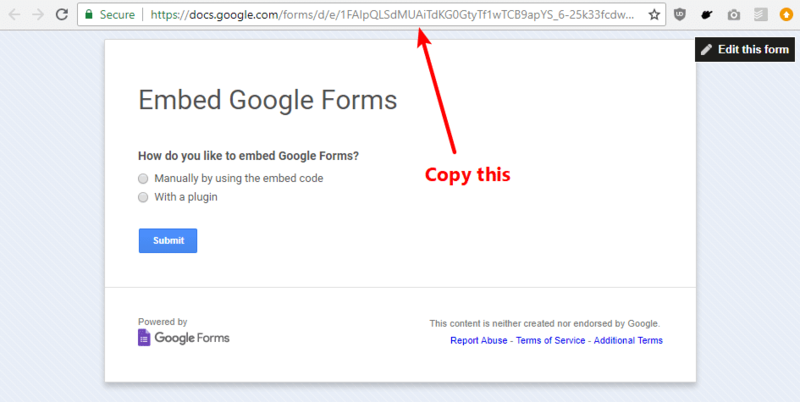 For most people, I think the best option is to just use the regular Google Forms embed code. While there are some issues with responsive design using that method, you can mitigate them a bit by setting the form width equal to 100%. The plugin is an interesting option, but I don’t like being forced to use the old version of Google Forms (which isn’t nearly as nice as the new one). Mike Walsh, the developer of the plugin, has mentioned making it support the new version, though. If he does that, I think the plugin would be a much more viable option. But right now, it seems like that’s unlikely to happen in the near future. 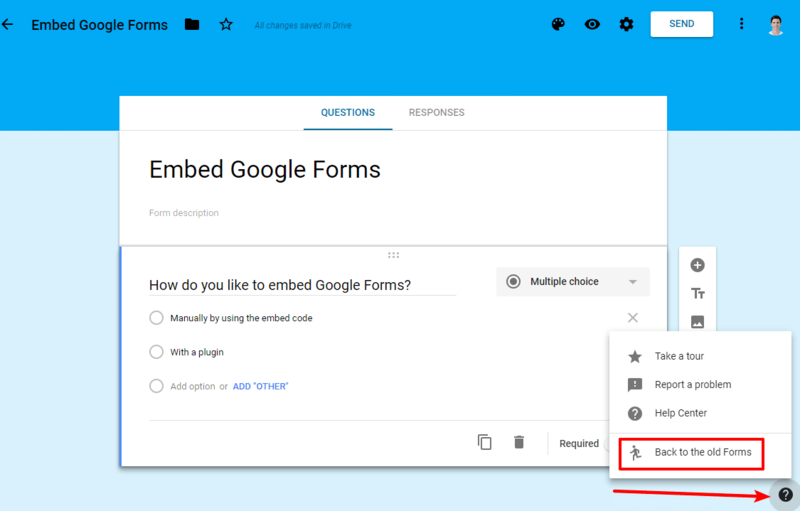 Have any other questions about how to embed a Google Form in WordPress? Leave a comment and we’ll try to help out! Thanks for that, and the tip about changing the width to 100% with the form embed. So it looks as if that may not be a viable option going forward. It’s a pity the plugin doesn’t work with the newer Google Forms. This was a serious concern for me. I didn’t try this out before now its easy for me to integrate it with my website. Thanks for sharing this information colin.